Ten years later Herzog accomplishes the picture he has been dying to make, a fictional film about Dengler’s story. Rescue Dawn is the same story with the same outcome, yet it plays as a surprising, powerful tale. 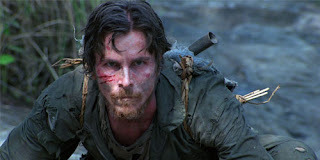 Christian Bale plays Dengler, a kind, German-born man who had long dreams to fly. Once America gave him his wings, his life was complete. On his first mission, his plane was shot down, leaving him stranded in the jungle, ultimately captured by Viet Cong. You’ve seen this all before, right? Believe me, not like this. When Dengler is brought to a village, hands bound with rope, guns pointing at his back, he is marched in front of dozens of curious natives. As he walks among them, he casts a huge smile. It’s a small effort that Bale makes shocking. His smile is sincere, Dengler is genuinely happy to be among people he’s never met, thinking his life will take a great new turn, no idea of the serious danger he is in. His trouble becomes more eminent once he begins to be tortured, in cringe-worthy, blood-free scenes. Soon, Dengler is taken to a POW camp where he is to stay indefinitely. It’s there that he meets fellow prisoners Duane (Steve Zahn), Gene (Jeremy Davies) and a few others. After fighting the day to day battle to survive amidst hunger and abuse from their captures, Dengler formulates a plan to escape. Each of the scenes in Rescue Dawn is powerful and engrossing. None more than the terrifying escape, which rivals the passengers of United 93 surging the cockpit, a true do-or-die moment that is hauntingly stunning. The rugged authenticity of the film gives it appeal. Herzog is a filmmaker of determined obsession. You will not, for a second, think Christian Bale is on a Hollywood back lot, in fake plants and tress. He is in the wild, digging and cutting his way through the thick bush. In a career formed on drastic bodily transformations (including accents), Bale has never been better. He plays Dengler with the man’s own self reliance and kindness. Bale, who shed 55 pounds for this role, delivers the best performance from any actor in 2007, so far. From tramping through bushes, to eating live insects, to tumbling through severe rapids, Bale is right there, putting his heart and sole into the powerful role. Steve Zahn is a revelation. The funny guy from That Thing You Do, Out of Sight, and Joy Ride, delivers a performance that you didn’t know he had in him. His Duane is a man on the edge of madness, torn between his perceptions of reality. While still, somehow, managing to throw some of his comic timing into the role, Zahn has opened the door for a new stage in his career. Be ready. Klaus Badelt’s score is some of the best music I have ever heard in film. Its powerful drums and delicate horns heighten each scene to sheer brilliance. And cinematographer Peter Zeitlinger, gets right into the jungle with the actors, rolling over the messy terrain or delivering a great, wide shot of an isolated landscape. Herzog, who is best known for his 2005 documentary Grizzly Man is one of our greatest living filmmakers. Often using a skeleton crew of just the principle actors, his camera man, sound engineer, and himself, Herzog never hesitates to try something new, as long as it is real. Every single stunt that the actors complete in the film, Herzog did first. If they had to walk through the jungle barefoot, among poisonous snakes and insects, then he would be first. Travel through the rushing river, Herzog is in the lead. When Bale demanded to eat the live insects, Herzog took the first bite. He proves to his actors that magic can be done in film. There is a sad truth to this picture. Rescue Dawn, which was released in American theatres in August of 2007, is a film that no one has seen. On DVD since November, this is one of the most criminally overlooked movies that I’ve ever come across. I could name several films in which Bale has been great, but I’m afraid I would be listing the bulk of his work. It is incredible that the man has never won an Oscar, let alone been nominated for one. If the people of the Academy would stretch away a little bit from Hollywood spectacles, then they would find this diamond in the ruff, this hauntingly wonderful film.